My inspiration comes from the pre-Renaissance or early-Renaissance painters such as Bellini and Perugino. Those painters considered themselves as Illustrators and not as Artists. This is how I see myself: An Illustrator. Painting for me can be very frustrating. Starting is usually easy but then there is a moment that the image I see or I imagine becomes muddled and it takes a while before I feel that I have painted the way I wanted it to be. Finishing is the hardest part but can be made easier by following a self invented trajectory in applying paint. Whenever I’m in a museum studying my favorite paintings I always search for methods and tricks the painter has used to make the picture alive. Not necessarily alive by using clever little brush strokes but alive in the sense that the negative space has a presence. I have great benefit from the works Baschenis, Bassano, Bonington, Caravaggio, Cassana, Constable, Cranach, Daubigny, Escher, Florisvan, Dijck, FraAngelico, Gauguin, Leger, Morandi, Moroni, Rafael, Ribera, Rubens, Severini, Sisley, Strozzi, Titian, Turner. I visit at least one museum a week. I lived in Monrovia, Liberia’s capital, with my mother, 3 brothers, 1 sister, 6 dogs, 1 pygmy hippo and 2 cats, in a large 2 story house, with a garden bordering on the beach. My mother ran a veterinary hospital on the first floor. Practically every day my brothers and I surfed the waves opposite our house. 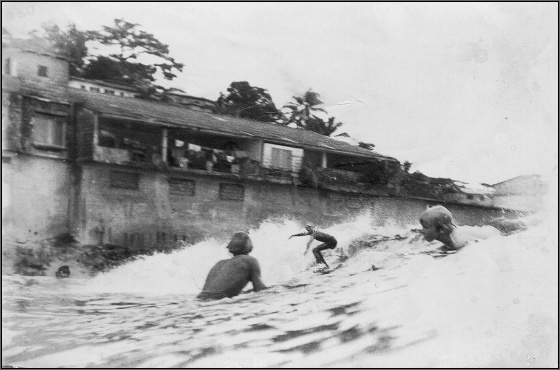 Merijn Van den Ende (center) and his brothers, surfing Mamba Point, Monrovia, Liberia, in the early 1980s. We were very young and my mother did not share our passion at all. Every time she saw us disappear in a wave she thought that she would never see us again. 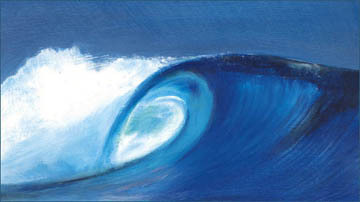 We would not hear of stopping it though because we simply loved to surf. Actually for me it was more than love: it was my life. Van den Ende recieved his first formal artistic training at the Academy of Art, in San Francisco, in 1989. He followed this with two years of study at the Hogeschool van Kunsten (College of Art), in Kampen, the Netherlands. He furthered his education by studying taxidermy at Canandaigua College, at Canandaigua, New York, in 1998-1999. He currently lives in Delft, the Netherlands.